The 1st Shenzhen Independent Animation Biennale organized by OCT-Loft, with theme as The World of Soul: As Virtual Artistic Engineering will invite more than 50 artists from home and abroad to participate and exhibit nearly 100 pieces of independent animated artworks. 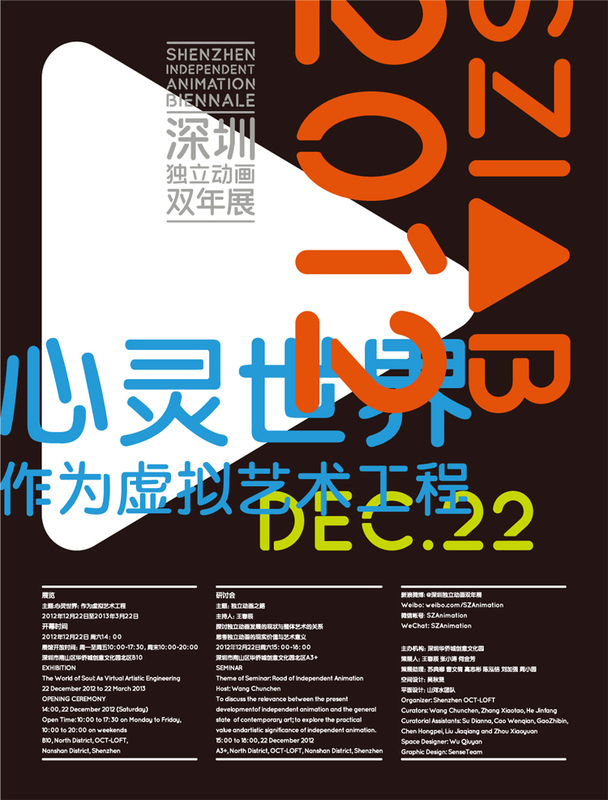 It is the first animation festival operated as biennale in China. We are very pleased to invite Mr. Wang Chunchen, Mr. Zhang Xiaotao and Ms. He Jinfang as the curators of this exhibition. Surrounded by the innovative spirit of OCT and the artistic atmosphere of art museums, since it was founded, OCT-Loft has devoted herself to push the development of contemporary art, avant-garde music and video and new creative design which are cross-media. As a fresh and important representation form, independent animation comprises of various artistic genres including literature, movie, music, photography, painting and new media, etc., which has become a new territory of contemporary art. Different from general commercial movies, children cartoons and animated cartoons, independent animation has its internal independence and new angle of displaying art. It’s not only the narrations of artists’ individual spiritual stories, but also the expansions of the multiple concepts and the outcomes of contemporary cultural context. Meanwhile, it contains not only the concepts and methodologies of contemporary art, but also the creation and technology of animation industry, which introduces the concept of contemporary art in a kind of omnipresent visual communicative language. Therefore, this exhibition is conveying not only the valuable academic interpretation, but also the extensive audio and visual symbols, which coincides with the developmental orientation of OCT-Loft. In current independent animation field, there are plenty of excellent works. During the short history of Chinese independent animation industry, the independent and conceptual works which are time-tested are precious and worth to be exhibited, exchanged and discussed further. As the first one of this event, by systematically combing and summarizing the archives, we will try to analyze the multi-dimensions of the emerging and developing of independent animation and of the relationship between independent animation with the contemporary art and the various new social media; and try to study and evaluate independent animation as an artistic media basing on the developmental path of contemporary art. We hope to present the abundant functions of art in society. In this activity, we will also pay much attention to the outstanding independent animated works from other countries, so as to build the animation biennale as an international platform for studying, exhibiting and exchanging in animation field. Along with the exhibition, we will also launch seminars on independent animation, and will invite some artists and critics to hold lectures and show works in OCT-Loft and domestic key academies, in order to explain all kinds of mistaken concepts besides commercial cartoon, to explore the real artistic values of independent animation, and to introduce this values to the public widely. What’s more, as the follow-up of this biennale, a competition on independent animated works will be launched. We will collect works from academies in Asia, and award and exhibit the winning works with a special fund, aiming to encourage more independent, original and experimental creation of animation, and to enlarge the space for the existence, development and discussion of independent animation. We will, with the respect for art and the responsibility to society, operate this independent animation biennale as a long-term event. With attention and support from the society, we hope to endow this art activity with continuous and fresh values, enabling it to have great influence on the contemporary art field and creative culture industry.